My bike experience in Seattle is all of 53 hours in duration, following a cross-state move and coinciding with the first few days in a new job, so consider this a series of blurred snapshots—about like what I’m able to take on a cellphone when I’m in a hurry and keep accidentally toggling the wrong options. Bikes, bikes everywhere! Lots of people biking, with the majority of them in cycling clothes. I don’t know what the ratio was in Spokane between street clothes and Spandex; here it seems to lean much more heavily toward Spandex. Only a couple of women in street clothes so far and only one other in heels. It’s like seeing a member of a secret sorority when I see a woman bike by wearing something she could have purchased at Nordstrom’s instead of North Face. A friendly bunch of riders at the First Thursday Artwalk reception in the Bicycle Alliance office, part of the monthly Pioneer Square event, with lively discussions of bike frames, velodromes, bike-friendly neighborhoods and routes, and other bikey topics. The same kind of reaction that I’ve gotten so many times before to my typical “bike outfit.” As I left the office Thursday night around 8 p.m. (after First Thursday Artwalk), a man passing with a group looked at my outfit and said, “You’re going to ride in those heels?” I answered yes with a smile. “That’s cool,” he said, and walked on with his group telling them, “She’s riding in those high heels.” If they’re tourists, I just became part of Seattle’s local color. Actual wayfinding for bikes! 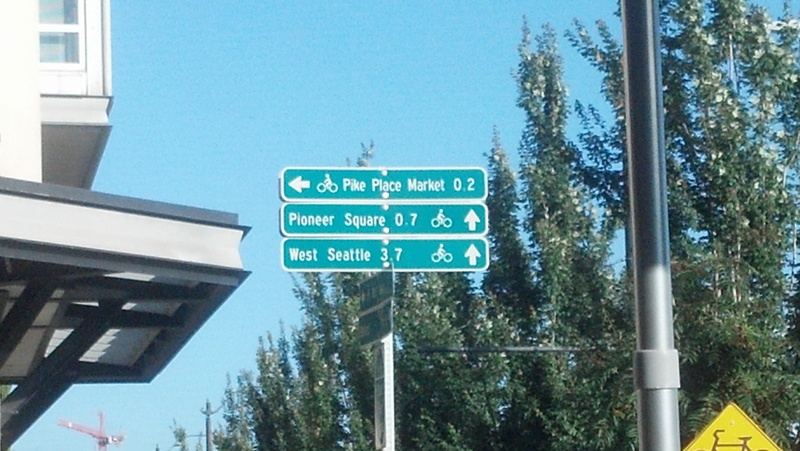 Signs throughout the downtown area with destinations and distances encourage you to recognize that lots of places to go are within an easy biking distance. Crazy zigzagging through the construction under the Alaskan Way Viaduct removal project. They aren’t picking on the bikes with the routing—it’s crazy for everyone. Same behavior on the multi-use pathway along Alaskan Way that I’ve observed on the Centennial Trail in Spokane, which is to say some people paying attention to the presence of other modes, others behaving more carelessly. So far, very decent behavior from motorists. In the thick of downtown it gets a little odd with lanes that allow parking at certain times but not at others, so we all get caught in a lane that we realize disappears at the end of the block where a couple of cars are parked. This creates a partial “pretend” bike lane alongside the parked cars if you’re willing to ride in the door zone but we all have to moosh together at the intersections somehow. I’m using the same smiles and eye contact techniques I did in Spokane and I wait my turn, and so far no one has cut me off or come too close for comfort. The heightened adrenalin rush I get from riding in heavier traffic on narrower streets even though nothing scary has happened. Drivers in Spokane who think Division Street between the freeway and Spokane Falls Boulevard is “too busy” to bike on should see what First Avenue looks like around 8:30 a.m.
People on the sidewalks on their bikes. It’s legal here but that doesn’t make it a good idea in my eyes—so many more pedestrians, so many more opportunities for some kind of collision. The fantastic ease with which I could pack a weekend’s worth of stuff into two Po Campo bags, ride to work, then ride to the Amtrak station and get on a train with my bike for a Portland conference. Oh, the joy of the bike/transit combo! And of course, an office full of bikes parked alongside desks and leaned up against walls since 100% of my new colleagues bike to work. If you’ve moved to a new city, what struck you most as far as differences in riding from the place you used to live? It’s nice to hear the perspective of a new Seattleite. Thank you. Welcome to Seattle! and to your new position. I hope by now you’ve ridden up Capitol Hill and seen lots more people in ordinary clothes. Who you see riding depends A LOT on where you ride!